How Far is Magnolia Cedar Court? Magnolia Cedar Court is a residential development in Bidadi, Bangalore. The project is built by Magnolia Group. 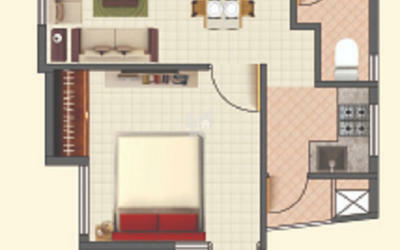 They provide Skillfully Designed apartment and apartments with all necessities. It is approved by Karnataka RERA. Sanitary ware - porcelain fixtures of Jaquar / American Standard or equivalent, Hot and cold wall mixer, Single wall mounted EWC, wash basin (without pedestal), one tap. Balcony: Anti-skid Rustic finish tiles of superior quality. Magnolia Group is an innovative group of companies which are involved in land development and layout formation in and around Bangalore. In an arena crowded with players big and small, the Magnolia group stands apart. The group has created a distinguished niche all its own, by consistently setting and rewriting standards in real estate and by delivering unbeatable value. For over 10 years now, the Magnolia group has created homes, apartments and residential enclaves that guarantee uncompromising quality and exceptional living environments. Every part of a Magnolia creation, from raw materials, build quality and fittings to the interiors and exteriors is a culmination of extensive planning, diligent groundwork and faultless execution. Today our steady effort and dedication has earned us the reputation of being one of Bangalore’s finest builders, with an impressive list of prestigious projects that have delivered supreme value and total satisfaction to each one of our customers. Our sincere commitment to understanding customer needs and interpreting them in inspiring ways has enabled us to continuously offer living spaces that are truly special. And our unblemished record of delivering on promises and our strict adherence to business ethics has earned us a special place in the field.